I am just in love with this 'candy coloured' look!! I think yuo definitely stood out from the crowd! that coat and those pants are beautiful! you're so lucky to be at NYFW (my dream). 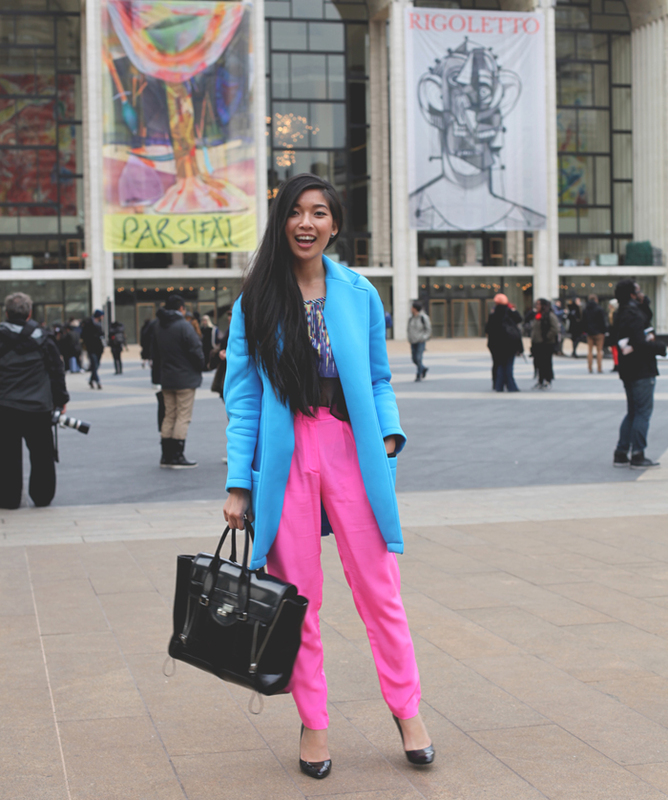 perfect colorblocking, such a bright and fun look! I envy you so much! That shade of blue is really beautiful... Kind of like a bubblegum blue? I love how you wear this shade with the actual bubblegum pink pants and a patterned tee... and also the sheer black fabric on the tee? Everything is perfect. I loved your outfit and the colors are just awesome! You're so lucky to go NYFW! Amazing Love this sooo much Steph! Gorgeous girl, you are flawless in these stunning colors! What a magical experience!